where denotes the difference between the successive time points, and the parameters and are called the level variance and the slope variance, respectively. The initial condition is fully diffuse. The trend component corresponds to the first element of this state vector. The second element of the state vector corresponds to the slope of this trend component. This model reduces to the polynomial spline model of order 2 if the level variance . See the section Polynomial Spline Trend. The following statements specify a trend-plus-noise model to model the growth of cows in the previous example ( Example 27.4). The only cows that are considered are the ones that received iron and are infected. The program is easy to follow. The PARMS statement declares var1 and var2 as positive parameters, which correspond to and , respectively. The programming statements define arrays tMat and covMat, which later become the matrices and , respectively. Note that the element tMat[2,1] is left unassigned, since it is a structural zero of (see the section Sparse Transition Matrix Specification for more information). Recall that the predefined variable _ID_DELTA_ contains the value of , which is needed for defining the elements of and (see the section ID Statement). The STATE statement defines the trend state vector, harveyLL, and the COMPONENT statement defines the trend component, trend, by selecting the first element of harveyLL. An additional COMPONENT statement defines the slope component, slope, as the second element of harveyLL. The slope component (which represents the cow’s growth rate) is not part of the observation equation; it is specified so that its estimate is output to for (the OUT= data set specified in the OUTPUT statement). The IRREGULAR statement defines the observation noise, and the MODEL statement defines the trend-plus-noise model. The estimates of var1 and var2 are shown in Output 27.5.1. 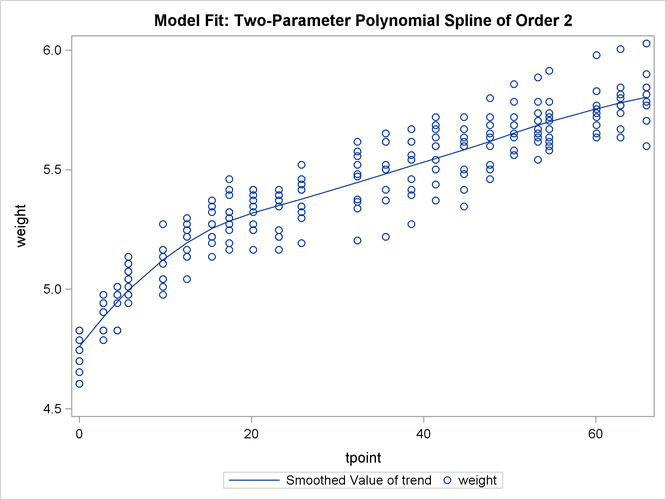 It shows that the estimate of the level variance is nearly 0, implying that the fitted trend model is identical to the polynomial spline trend of order 2. The estimate of the noise variance is shown in Output 27.5.2. 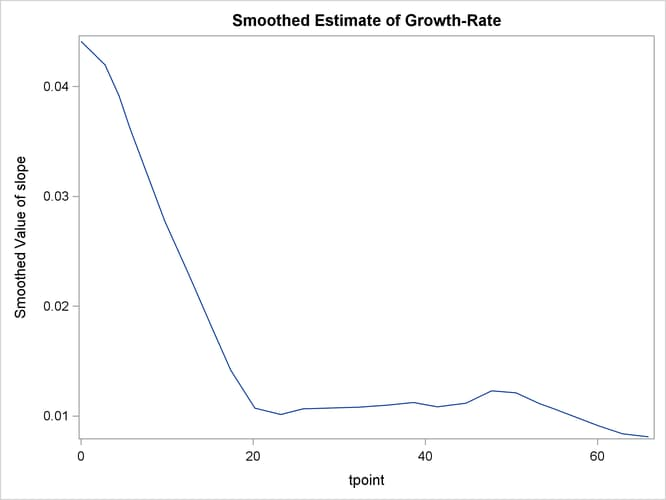 The following statements produce the plot of the fit of this trend model (shown in Output 27.5.3). The following statements produce the plot of the estimate of the slope component (shown in Output 27.5.4). This plot complements the preceding plot of trend; it shows the pattern of decline in the growth rate as the animals age.